Growing up in a very English household, I didn't experience too much Indian food other than the occasional curry. I've made tandoori chicken in kitchens I've worked in before, but I was never really interested enough to make it at home until a friend of ours made some for us last year. If you haven't had traditional Indian before, you're missing out! 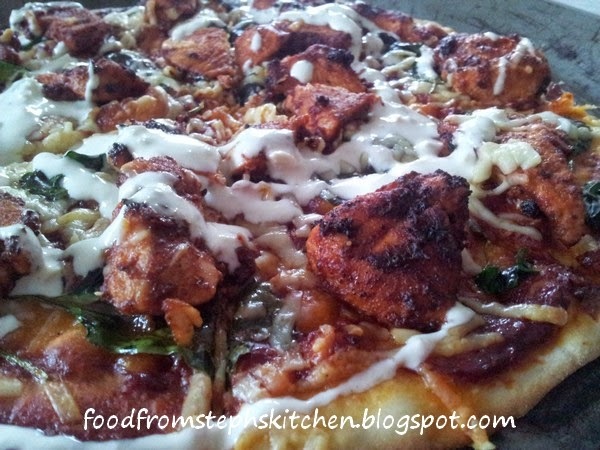 Using yoghurt, tandoori paste and additional spices, he changed my perspective completely. It might have been that he marinated it almost all day before cooking the chicken, or just the fact that adding in the extra spices brought out the flavour ten-fold - but Mr Steph and I still talk about that meal. From that moment I've had a little bit of a soft spot for tandoori chicken. 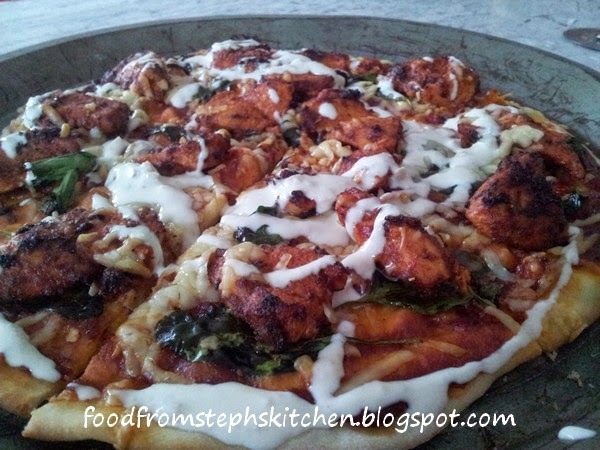 After Mr Steph loved a tandoori chicken pizza he ordered a few months ago, I decided to recreate it at home one night. It was a bit of a spur-of-the-moment sort of thing, so it's by no means traditional but more my twist according to what I had in the fridge. During our pizza making, I also perfected how to make crispy pizza base like that of a wood-fire pizza. Tips on how to do this is in the recipe below! 1. Mix the tandoori paste and sour cream together, tossing the chicken pieces through until they are well coated. Pop the chicken in the fridge to marinate. I like to marinate it for at least 40 mins (while my dough is rising), but if you're short on time 15 mins or none at all is fine. 2. Next, onto the dough. Add the flour, salt and yeast to a medium sized bowl, creating a well in the centre for the liquids. Pour in the oil and slowly add your water. I usually add in half the water and start mixing, slowly adding more bit by bit. I find it easier this way as sometimes you don't need all the water. You're looking for the dough to be slightly sticky but not wet. 3. Knead the dough on a floured surface until it's smooth (around 3 - 5 mins). Place the dough in a greased bowl (using spray oil or spreading a drizzle of oil around the edges), cover the bowl with cling wrap and tea towel, and place in a warm draft-free place. Allow to rise for 40 mins or until dough has doubled in size. 4. Divide the dough in half, roughly kneading it for 30 or so seconds before thinly rolling out each base - aiming for no more than 3mm. Place each base onto a large sheet of baking paper, large enough for the base with a little bit extra handing over for you to easy hold. 5. Turn your oven on to 180 C / 350 F and place the pizza trays in to heat up with the oven. I've found this is the trick to having that crispy, wood-fire like base. 6. Cook the tandoori chicken on a medium heat until cooked through and the chicken appears dark in places. Try not to cook the chicken any higher than medium as otherwise the tandoori coating will simply burn before the chicken is cooked. 7. Mix up the pizza sauce and spread thinly across both bases. Avoid having it too think as you don't want the pizza to be all sauce! 8. 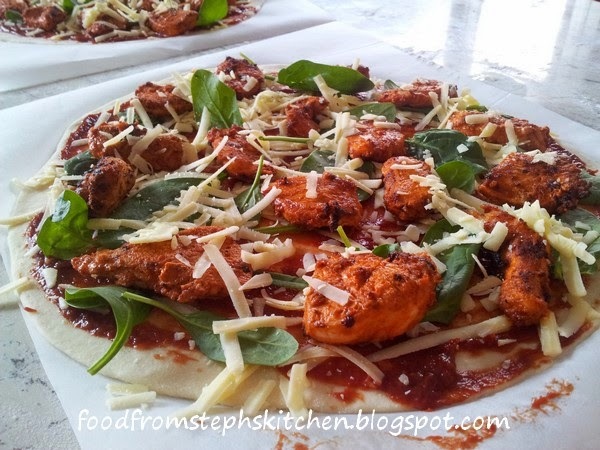 Sprinkle a small amount of your cheese on the bottom, followed by spinach, chicken and then the rest of the cheese. You'll notice that the cheese is quite sparse, but this is the way it should be. The key is to have a small amount of toppings. 9. Take the pizza trays out of the oven one at a time, and, using the sides of the baking paper, carefully place the pizza (still on top of the baking paper) onto the tray. Slip the pizza back into the oven and cook for 10 mins, then careful slip the pizza off the paper and onto the tray for another 5 - 10 mins until the cheese and edges are nice and crispy. 10. Mix the garlic sauce ingredients together, drizzling it over the top of the pizza just before serving. Again, definitely not traditional, but it goes together so well!